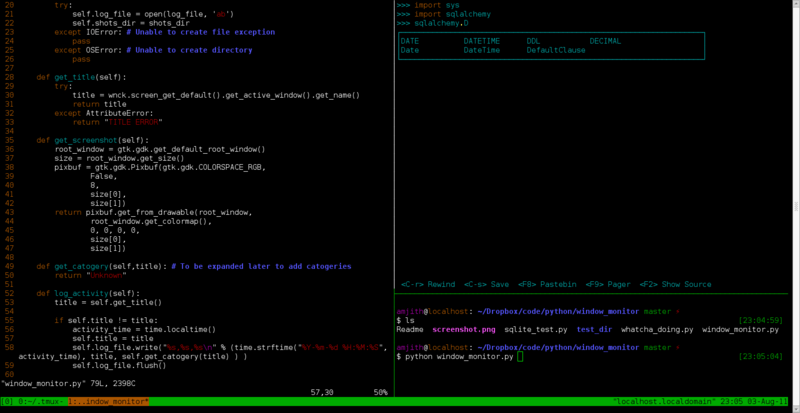 Tmux is an awesome replacement for Screen. I have a couple of standard terminal layouts for programming. One of them is show below. Vim editor on the left. Top right pane has the bpython interpreter. Bottom right pane has the bash prompt. In my tmux.conf file I have bound <prefix>+P to sourcing this file. So now anytime I want to launch my python dev layout, I hit <prefix>+<shift>+p. I decided to prepare myself for the Intro to AI, a free online course offered by Stanford. I found the course website: http://www.stanford.edu/class/cs221/schedule.html and wanted to download all the slides. It's time to pull all the ppt files from that page. Ta-da! Empty folders are gone. Remember if you are typing a command more than once in succession there is a way to automate it. Tmux is an alternative for screen. 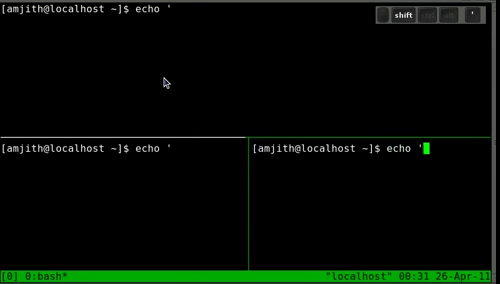 For anyone who doesn't know screen, it is a terminal multiplexer which means, it allow multiple windows in terminal. It can split your window into multiple panes (vertical/horizontal), detach a session which can be attached at a later time. Detach/Attach is very useful for running a job in a remote server without having to keep the ssh open the whole time. Tmux can be configured by ~/.tmux.conf file. My prefix key is Ctrl-q. This is immensely useful if you want to execute the same set of commands on multiple servers. Why do I hate Gnome? I've been using Ubuntu Linux on my netbook for the past couple of days and I'm quite pleased with the whole experience, except for the initial issues (I just won't trust the auto-update). Ubuntu uses the Gnome desktop environment by default with a little bit of tweaking. Gnome UI designers have a sense of aesthetic cognizance to their designs. I've always appreciated the crisp icons and the polished dialogs. I've been known to throw around the word stunning, quite generously, while describing Gnome. Quite intuitive wouldn't you agree? Why? Why would you think this is more intuitive than having a simple GUI driven control center? I'm told this was a conscious choice by Gnome developers because giving choices tend to confuse their users. No wonder Linus was pissed at Gnome and started recommending KDE. Today I presented in the Salt Lake Linux User Group meeting. The topic was "Hands on Intro - Git". It went well and I actually enjoyed it quite a bit. I choked twice once while trying to explain how to git apply patches that you receive via email, but then recovered from it with some help from the audience. But the second time I choked while trying to explain how to pull from multiple remote repositories, I couldn't recover from that. I do that so rarely it never occurred to me. Oh well, the first time is the hardest. Off to prepare for the talk tomorrow at the Utah Python Group. I'm presenting "Hands on Into - PyQt4".